83% of employees are stressed out and 55% are unsatisfied with their jobs. It leads to 70% of workers being disengaged, costing the US economy up to $500 billion in lost productivity every single year. The current way of working, isn’t actually working. And when the average person works 90,000 hours in their lifetime, the current way of living, isn’t really living. Luckily, humor helps. People who use humor in the workplace are more productive, less stressed, and happier. 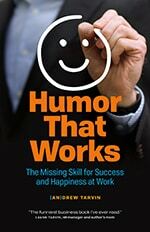 In fact, there are 30 benefits to using humor at work, no joke, sources included. There are three reasons people don’t use humor at work. Number one: they don’t think their boss or coworkers would approve. But 98% of CEOs prefer job candidates with a sense of humor and 81% of employees say a fun workplace would make them more productive. And even if they disapprove, no one can control how you think, after all, you are responsible for your own happiness. The second reason people don’t use humor is they don’t know. But using humor at work isn’t about being funny, it’s about making things more fun. Just be positive, inclusive, and think one smile per hour. The final reason people don’t use humor is they say they don’t have time. You will spend 1/3rd of your adult, awake life at work, and you don’t have time to be more productive, less stressed, and happier? You choose every day how you do your work, so why not choose humor that works?